The ramp allows for aquatic wheelchair access. 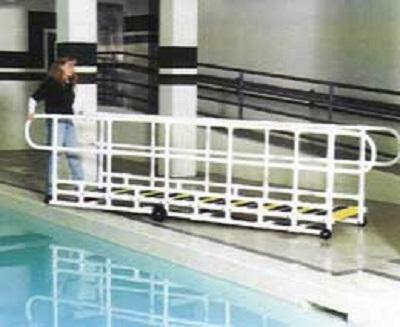 The Aquatrek2 Long Pool Ramp system is used to reduce the slope ratio for placement in deeper pools. Long Pool Ramp designed for pools over 48"
Designed as a practical solution for aquatic access, the AquaTrek2 pool Ramp lets people of all ages and abilities enter and exit the swimming pool with ease. This unit is built for heavyweight durability but maintains portability. The 30-inch wide treads provide a comfortable walking area. The noncorrosive metal reinforced siderails provide strength and stability for use in a commercial pool. Each tread comes with a nonslip safety surface in two colors, yellow and black. The Aquatrek2 standard access pool steps have a full 12" tread depth at 30" wide, rails are also at 30" wide. The standard access pool steps have a max riser height of 7" to maintain the full 12" tread depth . 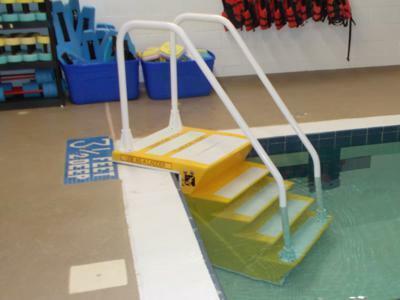 Easy Ladder is the perfect solution for the elderly, individuals with Arthritis, people needing recuperative therapy, young children, mothers-to-be, or anyone who is prevented from using a pool because of difficulty using a traditional vertical pool ladder. 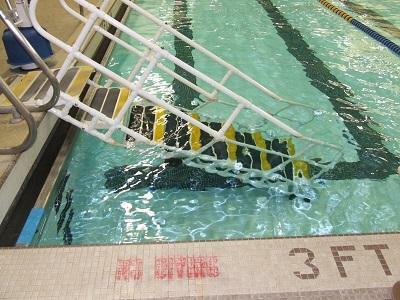 Our Easy ladder revolutionizes "Ladder Access" to the pool. The ladder requires NO deck or pool modification of any kind. Custom trimmed at the factory to fit almost any commercial pool, features quick and easy removal with our included dolly, insuring that lap-swim and competition swim meets are never compromised. Available in Medium Blue, Light Blue, and Safety Yellow!